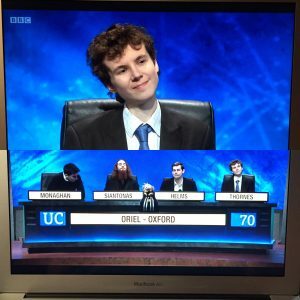 President of the Oxford University Animal Ethics Society (OUAES) Tobias Thornes will be competing for Oriel College, Oxford, in the next round of the prestigious television programme University Challenge. The Oriel team defeated the University of Manchester in the first round. Tobias is a doctoral candidate in Climate Physics at the University of Oxford. He has written on ‘Animals and Climate Change’ for the Journal of Animal Ethics and is an outstanding President of the Society. The episode will appear on BBC 2 on Monday 9th January, 2017. For more information about the show, see the University Challenge website.